For us old timers, 1969 doesn’t seem that far in the past. It doesn’t feel like it was just yesterday or even last month then again it certainly doesn’t feel like 45 years ago. It was back then American Jack Nicklaus exhibited an act of sportsmanship hard to imagine; conceding Tony Jacklin of the Great Britain & Ireland team his putt on the 18th hole causing the 1969 Ryder Cup to finish in a draw. 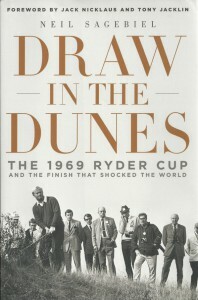 Stirring stuff to be sure and Neil Sagebiel in his new book, “Draw In the Dunes – The 1969 Ryder Cup and the Finish That Shocked the World,” recounts the times, the circumstances and perhaps best of all, the background needed for readers to put the 1969 Cup and Nicklaus’ concession into perspective. Back then the biannual matches, played solely for that somewhat odd-looking cup donated by seed merchant Samuel Ryder, were not really anything more than an exhibition and in fact had become a bit old-hat. The Americans had been totally dominant over the previous 17 matches (which began in 1927 with time out for the war) winning 14 times often by ridiculous margins. The truth was with very few exceptions all the best players in the world were Americans over that 40 year span. In 1969 Captain Sam Snead flew to England to compete at Royal Birkdale with the likes of Raymond Floyd, Jack Nicklaus, Gene Littler and Lee Trevino, all future members of the World Golf Hall of Fame. They teed it up against a GB&I squad captained by Eric Brown relying on besides Jacklin, Peter Alliss, Peter Townsend and an aging star, Christy O’Connor Sr. And though O’Connor and Alliss (for his broadcasting talent rather than on course accomplishments) did make it into the Hall, before the matches began the smart money was on the Americans. That’s not the way things went however as we know. In the end it took an unstinting act by Nicklaus (angering to no end team Captain Snead) to produce the only draw in Ryder Cup history. Astonishing then and today, in light of the hype and pressure and media focus on every little word and gesture of everyone having anything to do with the Ryder Cup (even for heaven’s sake the caddies! ), doubly astonishing. Sagebiel explains all of this and more with just the right amount of detail including descriptions of the matches without falling into the hackneyed trap of golf storytellers, “…and then on the next hole he hit a 256-yard drive into the first cut of rough behind a rhododendron bush requiring him to punch out 56-yards,…etc., etc. etc.” He has the ability to use the proper words while digging to the correct depth without being boring nor does he attempt to show off how smart and knowledgeable he is. Bottom line—if you are interested in golf, the Ryder Cup, its history and its personalities, you will enjoy this book and give it a permanent spot on the shelf. 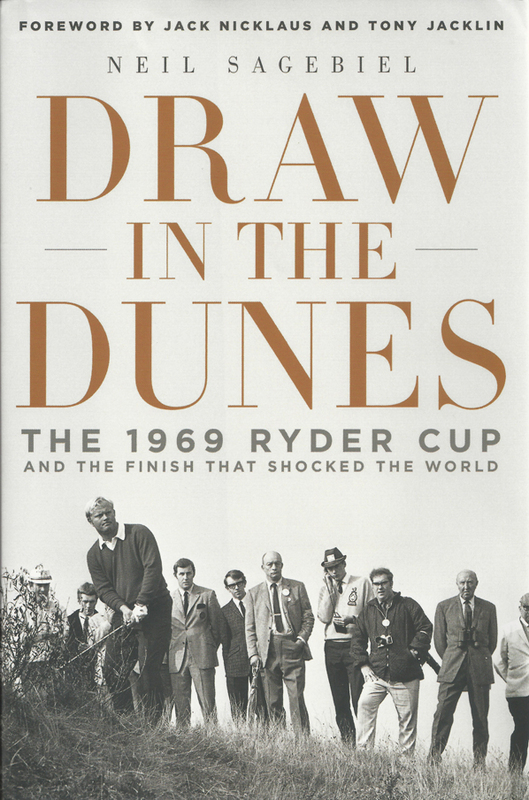 “Draw In The Dunes” will be published next Tuesday just in time for the 2014 edition of the Ryder Cup.